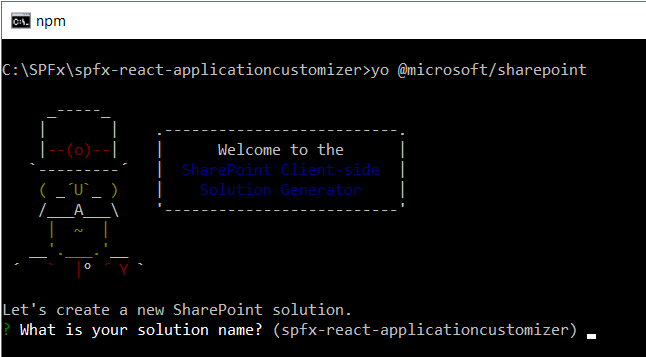 In this article, we will explore the how we can use React components in the Application Customizer part of SharePoint extensions. SharePoint Framework (SPFx) Extensions extend the SharePoint user experience by customizing predefined placeholders in the SharePoint site. As of today, we can extend the top and bottom placeholders to customize the header and footer section. React components help to develop functionality independently by maintaining separation of concerns. These React components can be used as part of application customizer. Open the command prompt. Create a directory for SPFx solution. Navigate to the above-created directory. Run the Yeoman SharePoint Generator to create the solution. Yeoman generator will present you with the wizard by asking questions about the solution to be created. Solution Name: Hit Enter to have a default name (spfx-react-applicationcustomizer in this case) or type in any other name for your solution. Target for component: Here, we can select the target environment where we are planning to deploy the client web part i.e. SharePoint Online or SharePoint OnPremise (SharePoint 2016 onwards). Place of files: We may choose to use the same folder or create a subfolder for our solution. Selected choice: Use the current folder. Deployment option: Selecting Y will allow the app to deployed instantly to all sites and will be accessible everywhere. Permissions to access web APIs: Choose if the components in the solution require permissions to access web APIs that are unique and not shared with other components in the tenant. Type of client-side component to create: We can choose to create client-side webpart or an extension. Type of client-side extension to create: We can choose to create Application customizer, Field customizer, or ListView Command Set. Application customizer name: Hit Enter to select the default name or type in any other name. Application customizer description: Hit Enter to select the default description or type in any other value. Yeoman generator will perform scaffolding process to generate the solution. The scaffolding process will take a significant amount of time. Once the scaffolding process is completed, lock down the version of project dependencies by running below command. In the command prompt type the below command to open the solution in code editor of your choice. To use Office 365 UI Fabric controls, type below command. We will explicitly install the 5.x version of the Office UI Fabric to our solution. One thing to note here is that during the solution creation, Yeoman generator did not ask us for the choice of language to use. Open ReactHeaderFooterApplicationCustomizer.ts under “\src\extensions\ reactHeaderFooter \” folder. To get access to placeholders on the page, use below imports. Update the interface IReactHeaderFooterApplicationCustomizerProperties to include Top and Bottom properties. Use this.context.placeholderProvider.tryCreateContent to get access the placeholder, without assuming that the placeholder will exists. Add a new file to solution – ReactFooter.tsx. Open src\extensions\reactHeaderFooter\ReactHeaderFooterApplicationCustomizer.ts. Add below imports. Update _renderPlaceHolders method to include our React component. Open serve.json under config folder. Update the properties section to include page URL to test. On the command prompt, type the below command. The SharePoint site will open. Click “Load debug scripts”. Observe the footer on the page. 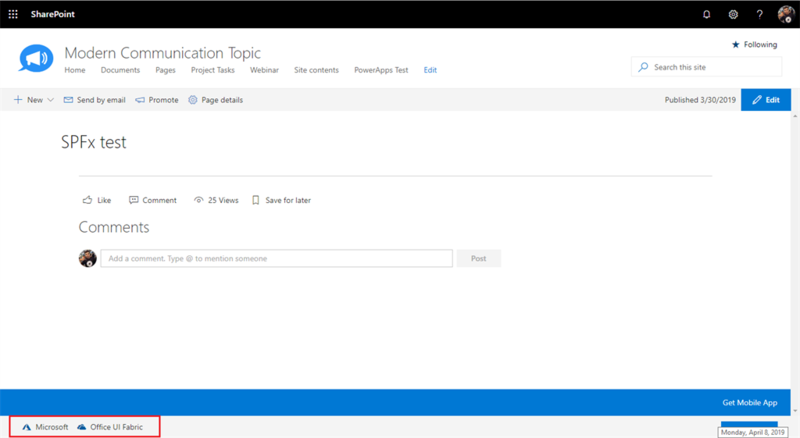 Application customizer SharePoint Framework extension helps to extend the predefined placeholders on Modern SharePoint pages. React components help to develop functionality independently by maintaining separation of concerns. These React components can be used as part of the application customizer.